The Return of Battlegames Perhaps? 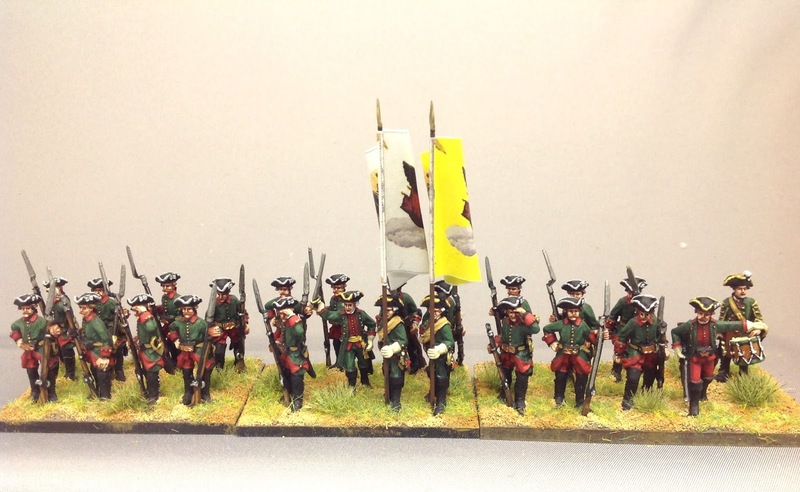 I finished another battalion of SYW Russian infantry for my Zorndorf Project, this time a musketeer battalion in the Observation Corps. 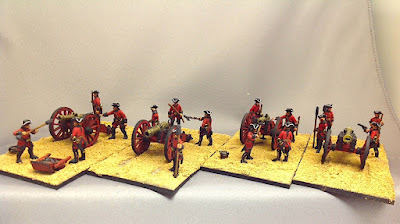 I used some of the Minden Russian artillery crew figures and gave them some muskets so that they look like a battalion of soldiers that are standing "at ease" waiting for orders or resting until the battle comes to them. The flags were copied from the Kronoskaf web site. 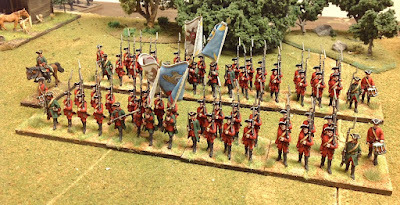 I recruited the standard bearers and drummers from the Fife & Drum AWI Hessian musketeer range of figures. The two NCOs (pointing) and the officer holding his sword over his head (why oh why do they do this?) are Minden Prussian jagers. Finally, the officer standing next to the colour bearer is one of the Austrian officers from the dismounted staff set of figures. The 5th Musketeer Regiment in the Russian Observation Corps. I had to kind of "fudge" things a little bit since none of the figures' uniforms are exactly correct. For example, most of them are not wearing the cavalry boots that the soldiers wore. If anyone wants to call me out on this and complain, then my story is that they were recently issued shoes and gaitors and got rid of the cumbersome cavalry boots. Also, the regiment probably left their green coats back at the baggage park and fought in their red sleeved waistcoats since Zorndorf was fought in August. However, the artillery crew figures are wearing the belly box cartridge box which makes them good candidates to be used as Observation Corps figures. The officers all have boots so I did not have to make any changes to them. I added some green epoxy putty to the gaitors on the standard bearers to turn them into cavalry boots. I am happy with the way that this unit turned out. When I first saw the artillery crew figures, my first thought was "these guys look similar to the Observation Corps soldiers". Fortunately, I had some spare muskets that I could put in their hands to make them infantry. I think that I might add these figures, muskets in hand, to the Minden range so that they can be used as Russian artillery fusiliers, which were attached to the artillery companies to provide some protection for the crewmen in case the enemy got too close. Click on the link below to read about the history of the regiment, courtesy of the Kronoskaf web site. In 1756, the Observation Corps was still recruiting and organising in Moscow and did not take part in the campaign. In the Autumn of 1757, the regiment (only 3 battalions instead of the 4 battalions originally planned), initially stationed in Moscow, was sent to Novgorod. In January 1758, the Observation Corps was finally ready and marched to the theatre of operation. Then the 3 battalions of the regiment took part in the Russian invasion of East Prussia. In July, the Observation Corps could align only 12,000 men. On August 6, during the invasion of Brandenburg, it marched from Paradise Kloster through Birnbaum to Schwerin on the Wartha river where it encamped. On August 10, Czernichef was instructed to march from Schwerin to Landsberg with the Observation Corps. On August 23, the Observation Corps marched from Landsberg to make a junction with Fermor's main army at Zorndorf. The junction was made at 2:00 PM on August 24 and the Observation Corps was deployed en potence on the flank facing Quartschen. On August 25, the regiment took part in the battle of Zorndorf where it was deployed in Thiessen's Brigade in the first line of the Observation Corps. About mid November, the regiment took its winter quarters in an area extending from Thorn (present-day Torun) to Culm (present-day Chelmno) as part of Braun's corps. On July 23 1759, the regiment took part in the battle of Paltzig where it was attached to Golitsyn Observation Corps. It was deployed in the first line of the left wing. A few weeks later, on August 12, the regiment fought in the bloody battle of Kunersdorf where it was deployed in the first line of the left wing as part of Essen's Brigade. During this battle the Observation Corps suffered so heavily that it was no longer able to operate as an autonomous corps. At the beginning of 1760, the entire Observation Corps was disbanded and its troops integrated into the Fusilier Regiments of the Artillery. By the way, if you are not already familiar with Kronoskaf, then by all means click on the link and look at the vast array of information that they have collected about the Seven Years War. A close-up view of the battalion. 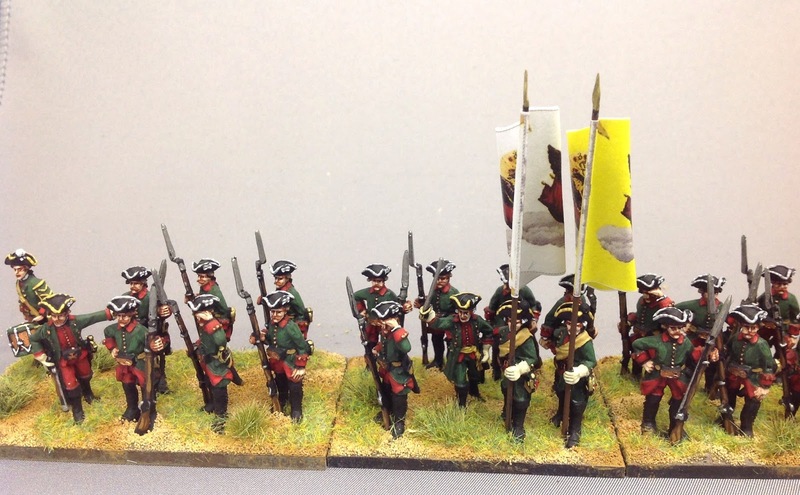 The command stand uses two AWI Hessian standard bearers and a Prussian jager officer holding his sword over his head. At the far left, a Hessian drummer and a Prussian jager NCO have been recruited into the regiment. I could only get three of the four stands into this close up picture. It gives a better view of the "at ease" look of the battalion that is created by using some of the Russian artillery crew figures. 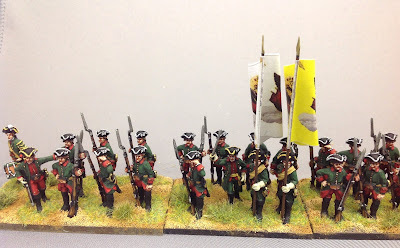 With the completion of this battalion, I now have 9 of the 12 battalions that I will need for my Russian army in my scaled down version of Zorndorf, which will be played at the upcoming Seven Years War Association convention (April 5-6, 2018 in South Bend, IN). King Frederick II and his staff. From time to time I like to pull my copy of Christopher Duffy's book, Prussia's Glory - Rossbach and Leuthen 1757, off of my library bookshelf and thumb through the book looking for some of the stories and first hand accounts that Duffy scatters throughout the book. So I thought that I would share them with you. In the future, I hope to post my first hand accounts on my blog. Prince Charles knew nothing of the ground except what they had been able to glean before darkness fell on the 4th, and the lack of salient features told to their disadvantage. According to one story Daun had to ride up and down in front of his army on the morning of the day of the battle, and asked the peasants to tell him the names of the villages and other objects. Amongst other things his eye was caught by the tower of a church which could be seen rising above a hill. "What is that," he enquired of a peasant. The man assumed he was talking about the hill and replied, "Your Excellency, that is the hill from which our king drives the Austrians every year." Daun turned to his suite and remarked, "Gentlemen, I do not like the sound of that!" Kolin in Bohemia had been the stamping ground of the big Austrian maneuvers in the early 1750s, but here the tables were turned. Austrian battle line facing south towards its left flank at Sagschutz. From my solo game of Leuthen. I have fought the battle of Leuthen a number of times, both as a multi-player game and twice as a solo game, the latter fought in the Mancave at Schloss Seewald. The purpose of having this vast collection of toy soldiers is to play with them in wargames. My solo games hark back to my boyhood days when I would set up my Britains 54mm toy soldier in the family living room on the floor and keep myself busy for an entire afternoon. So I enjoy hauling out the Winter terrain mats, trees and buildings and having a good knock down epic wargame tout seul. 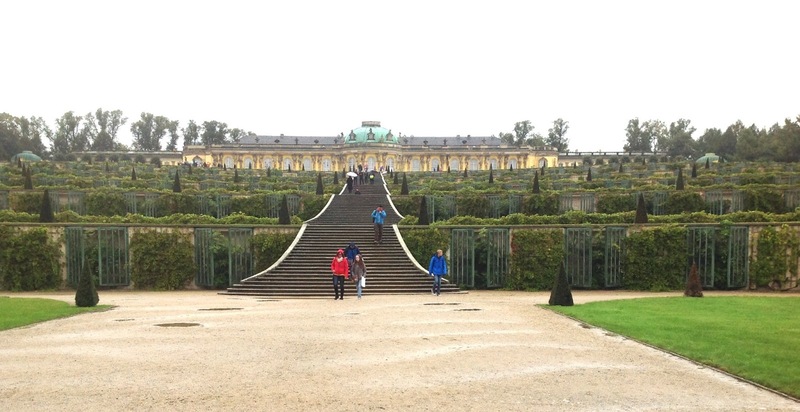 The royal palace of Sans Souci, the residence of King Frederick II of Prussia. King Frederick II of Prussia was born on January 24, 1712 so today we (me, at least) honor the orginal der Alte Fritz on his birthday by holding a regimental review of the Potsdam garrison. The King wakes up early at his royal residence in the palace of Sans Souci and hurries to the parade ground where he will inspect the troops. The Potsdam garrison marches from its barracks and onto the parade ground. The regiments wheel right from column into line formation to present their colors to the King. The King rides along the ranks to inspect the troops. 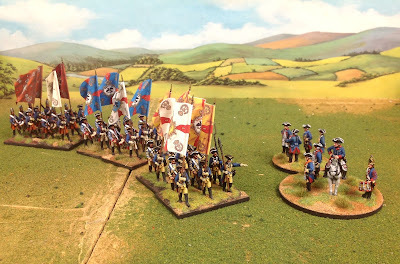 Once the colors of all of the garrison regiments have marched under the review of the King, the regiments will form into their brigades and have Frederick review the troops by brigade. Satisfied that everything meets His keen standards, the Garrison marches past the King in review by brigades. 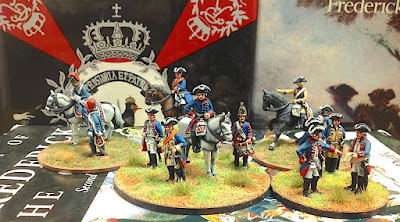 The first brigade consists (from right to left) of the Alt Braunschweig, Prinz Moritz and von Diericke regiments. The first brigade makes a smart wheel to the right and passes the review stand. 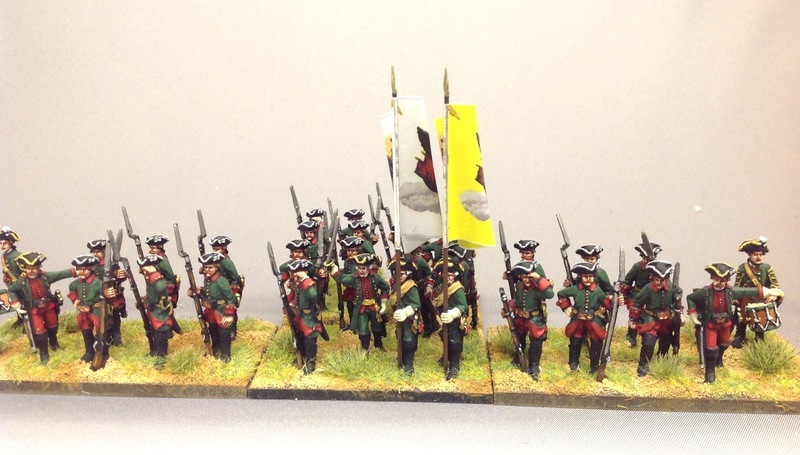 The second brigade includes the cream of the crop of the Prussian army. Marching right to left are the Guards, the Winterfeldt and the Itzenplitz regiments. Exactly on que, the brigade wheels to the right in order to pass the review stand. And now the entire garrison forms to march in column past the King. The entire garrison forms up by companies and makes one more passing of the King on the review stand. It is a good day in Potsdam because the King is pleased with the performance of his troops upon the parade ground. The King will reward each inhaber with a small purse of gold ducats. And now, the King will return to Sans Souci and take his Greyhounds for a walk or practice one of his own flute compositions. 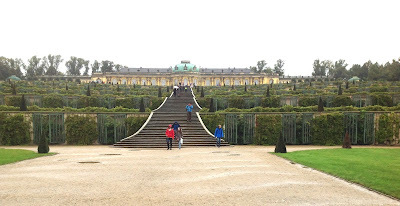 The view of Sans Souci and its terraced garden. The French Gardes Francaises and Suisses deploy between Fontenoy and Bois du Barry. 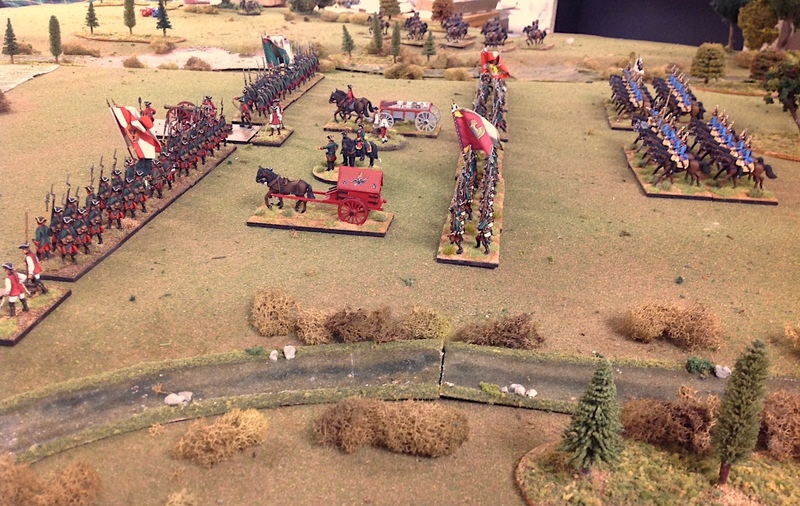 French cavalry backs up the infantry in the center. From time to time I would like to post pictures of other people's collections of wargame figures that really stand out in my mind. So today, let's start with a look at the collection of UK wargamer Steve Langen, who has built up an incredible collection of War of the Austrian Succession (1740 - 1748) French and British armies. Nearly all of the figures are sculpted by the talented Richard Ansell in 1/56 Scale (approximately 30mm tall) and include Minden Miniatures and Crann Tara Miniatures and some Fife & Drum Miniatures artillery equipment. 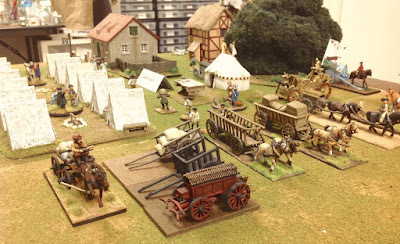 Steve recently refought the Battle of Fontenoy (1745) and was kind enough to let me post pictures of his magnificent collection of miniatures and terrain pieces. A description of the French battle line, stretching from the Redoubt d'Eu on the left, to the town of Fontenoy in the center, and on to the town of Antoing on the French right. The pictures are posted in order from the French left to the French right. Aeriel view of the French deployment at Fontenoy stretching from the Redoubt d'Eu at the top of the picture to the left of the woods; the French Gardes brigade and cavalry defend the gap in the center; the town of Fontenoy on the middle right; and more French in redoubts between Fontenoy and Antoing. The French army's left wing was a strong position with the Bois du Barry woods to its front with two redoubts on the left. French light infantry were deployed in the woods and well placed to pepper the flanks of the approaching British with musketry. If the British survived the passing of the woods, then they would run into the Redoubt d'Eu, which could enfilade their attack on the right flank. The Bois du Barry woods anchors the left flank of the French battle line. The Arquebusiers de Grassines, light troops, defend the woods. and can provide enfilading fire on any attack that comes in the center. The French center stretched between the Redbout d'Eu on its left and the town of Fontenoy on its right. French general Marshal Maurice de Saxe correctly reasoned that the most likely point of attack by the British and allies would be in the center. Accordingly, de Saxe placed his best troops: the brigade of French and Swiss Gardes and backed them up with the cream of the elite French Household and line cavalry. Anchoring the French right flank was the town of Fontenoy. De Saxe had fortified the perimeter of the town and stuffed it full of cannon and French infantry. French infantry defends the town of Fontenoy. Finally, the French defences behind Fontenoy stretched to the River Scheldt and the town of Antoing. The open areas between Fontenoy and Antoing were defended by more redoubts. French artillery was posted on the other side of the river, where they could enfilade and attack in this sector the battlefield. The leader of the British and Allies (Dutch, Hanoverians and Austrians), the Duke of Cumberland, decided to attack the French center with his British troops, while the Dutch troops would attack the Fontenoy-Antoing position. The Hanoverians were placed to add weight to the British attack and to possibly attack the salient in the French line - the town of Fontenoy. The British Guards advance towards the French center. The British attack moves towards its date with the French center. The second wave of British support the first line of British Guards. I hope that you enjoy this tour of Steve's collection of figures and terrain. I think that you will agree with me that this is an exceptional collection of painted figures. I can truthfully say that this may well be the best looking collection of mid-18th Century armies and figures. It sets the bar high for everyone else. I find Steve's collection inspiring and it gives me some ideas about things that I could do with my own collection. I would like to draw your attention to a new project that Henry Hyde is initiating on Patreon that will create a sort of on-line wargaming content somewhat similar to his old Battlegames magazine. Individuals are invited to become "patrons of the arts" and support Henry's efforts with a payment of a monthly subscription that can be as low as $1.00 or as high as you want to go. 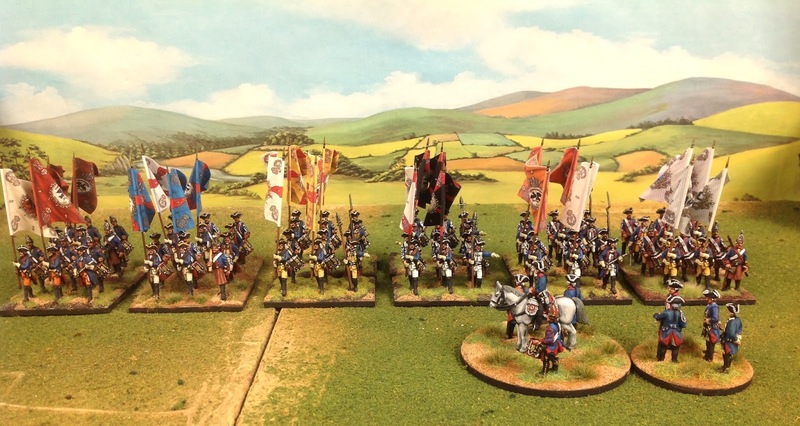 Patreon is a form of on-line crowd funding, but rather than investing in a tangible product such as a boardgame or a new range of wargame miniatures, you are underwriting the artist's creation of content on a monthly basis. To be clear, this is not a financial investment where you will expect some sort of financial return on investment. You are providing funds, on a monthly basis at an amount of your choosing, to provide the artist with a monthly income of sorts so that he can spend part of his time doing his regular free-lance graphic design work and part of his time creating content for his patrons. In return, patrons will have access to newly created content on blogs, 30 to 60 minute podcasts, videos in addition to other written articles and graphics pertaining to gaming or military history. I know that I am doing a poor job of trying to explain the venture, so I invite you to click on the link below and read about it in Henry's own words. But the most important thing about Patreon as a model is that, rather like the patrons of the arts of previous centuries, it creates a direct link between you, the consumer, and me, the creator. More than just a financial transaction, it creates a bond, a deeper level of interaction than is possible if you were just buying a magazine off a shelf or a picture off a wall. Your input, suggestions, feedback and requests will be crucial in creating my output, to build a body of work that is satisfying to both of us. Already, in the comments below the blog post where I floated the idea, potential patrons are helping to shape my ideas about what to create, how often and even at what size, such as the length of podcasts and so on. If you have a great idea, let me know and I'll do my best to make it so! I have read Henry's prospectus on the campaign and am sufficiently interested and intrigued by the concept to "invest" a certain amount of money in Henry on a monthly basis. I won't say what level of funding I'm participating at, but I feel that I should put my money where my mouth is by signing on as a patron to this venture. If you enjoyed the old Battlegames magazine and Miniature Wargames during Henry's tenure as editor of both publications, then I think that you will be interested in this venture. So click on the links above and take a look to see for yourself and then make your own decision on whether or not to become a patron. Minden Russian Artillery (L-R): 6-pd, 12pd, 12pd unicorn, and Shuvulov Howitzer. Crew are available in "Loading" and "Firing " poses. Over the weekend I completed another Russian musketeer battalion - Permski - and based that and four Russian artillery crew with cannons. The artillery sets had been painted quite awhile ago, but had yet to be based. The artillery pictures in this post show the bases prior to the addition of tufts and static grass, so the models will look much better after tomorrow when I can add the greenery. I use a "goop" of Red Devil Premixed Spackle Compound with brown paint, stirred together until the mixture looks like bad chocolate pudding. The goop is troweled around the feet of the crewmen and onto the base, then dipped into a box of fine railroad ballast material. I then shake of the excess grit and set the model aside so that it can dry. The goop is relatively dry within an hour or two, but I prefer to wait at least 12 hours to a day before going to the next step of the basing process. Once the base is sufficiently dry (i.e. you can dry brush paint over the grit without any of the material falling off), I take a pot of Howard Hues Geo Hex Brown paint and with a large brush, stipple (a painting process where the brush is pushed against the canvas rather than using a brush stroke) the paint over the grit in a random manner, and then set it aside for the next step. I don't comletely cover the base in the Geo Hex Brown, but rather, allow some of the natural color of the grit to show through. This is sort of a reverse Shade Color/Highlight Color wherein the background is a light color and the contrasting dark color is on the top. Next I add tufts, clumps of grass, to the base - usually no more than four tufts per stand. I use regular white glue for the tufts and static grass. Once the tuft glue is set, then I brush on random blotches of white glue around the stand. The glue usually is brushed into the depressions/low lying areas of the base, while the higher elevations are kept grass free. I then sprinkle static grass onto the wet glue and shake off the excess static grass. The glue usually sets within ten to fifteen minutes and then you are done with the basing. 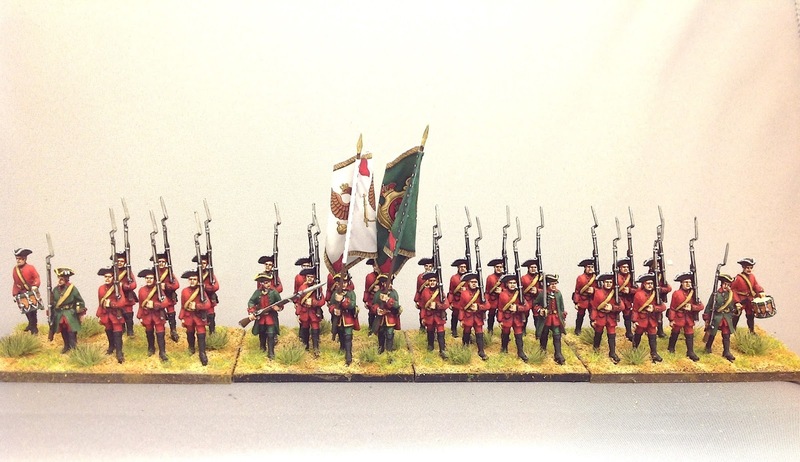 The recently completed Permski regiment showing the finished bases. 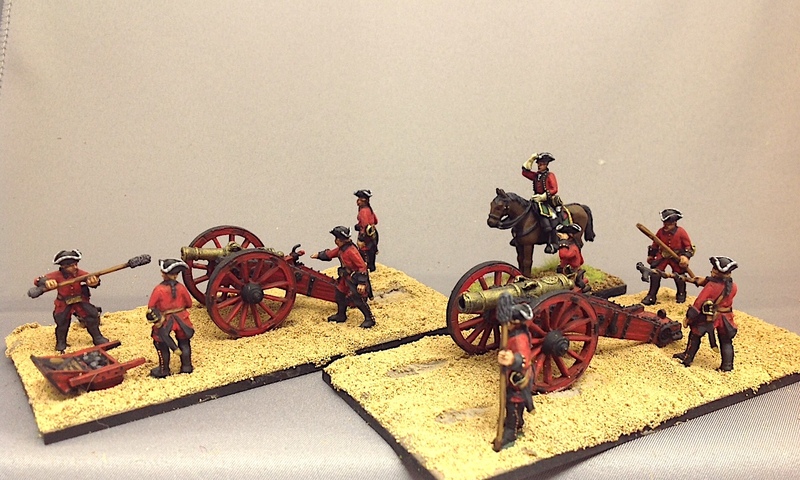 The Minden/Fife & Drum Miniatures range of SYW figures currently has four Russian artillery pieces. These consist of field guns of 6 pounds and 12 pounds; and two different howitzers including the 12 pound Unicorn and the Shuvulov Howitzer. The 6-pdr and 12-pdr field cannon, showing the loading and firing artillery crewmen poses. Howitzers: Unicorn on the left and the Shubulov "Secret" Howitzer on the right. I have a few more cannon left to paint for my Russian Project and after that I will tackle the limbers and horse teams that provide transportation for the artillery pieces. I am also considering painting some of the artillery crewmen as Artillery Fusiliers. I will simply take some of the crew poses that could hold muskets and then glue some spare Minden muskets that I have. Or they could depict an Observation Corps musketeer battalion. That brings you up to date on the Russian Project. So far we have 7 battalions of infantry and 9 squadrons of cavalry plus four artillery pieces. I am about half way through the Russian infantry, for my own needs. 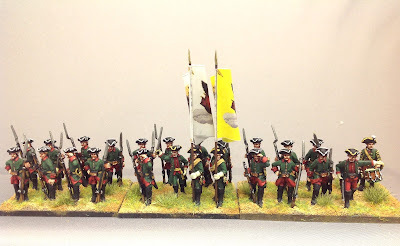 I need to have 12-14 battalions of Russians for my Zorndorf game at this year's Seven Years War Association Convention in South Bend, Indiana on April 5th through the 7th. We are working on adding Russian grenadiers, both Observation Corps and regular infantry, to the Minden Miniatures range of figures. I thought that readers would like to look at some of the pictures of mitres that we have collected to help our sculptors. Images from John Mollo's book on SYW uniforms. Unknown source collected from Pinterest. Russian Zorndorf Project - Galitzin's division between the Galgen Grund and the Zabern Grund. Click all pictures to enlarge the view. We are knee-deep in ice and snow here in Hesse Seewald, so what better way to pass the gloom of Winter than to ramp up our Russian Zorndorf project in full gear. 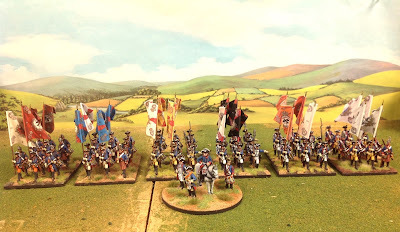 My target date for completion is the end of March 2018 so that I can host the Zorndorf game at this year's Seven Years War Association convention in South Bend, Indiana. This year is the 260th anniversary of the Battle of Zorndorf, fought on August 25, 1758. Realistically, the battle between the Russians and Prussians was fought to a draw, but Frederick claimed victory based on his possession of the field after the Russians marched off to their baggage train. This undoubtedly gave inspiration to Napoleon to "lie like a bulletin" when he would report the results of battle wins and losses. My plan is to build 16 battalions of Russian infantry, 5 regiments (24 figures each) of cavalry, 4 field artillery pieces with crew and limber teams, and 2 to 4 light regimental guns. The army will be divided into three infantry brigades: Galitzin, Saltykov and the Observation Corps commanded by Browne; and one cavalry brigade commanded by Demiku. The infantry will include approximately 4 battalions of Observation Corps Musketeers and maybe one battalion of OC Grenadiers if the later figures are available to me. 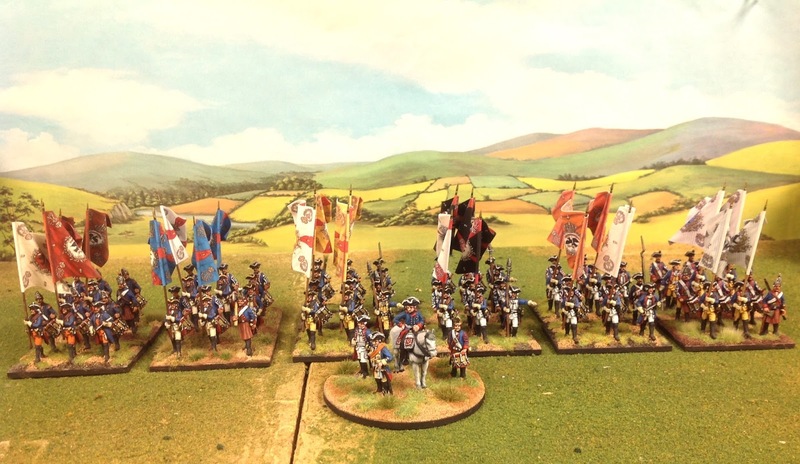 There will be at least 2 regular grenadier battalions added to 8 to 10 battalions of Russian Musketeers. The cavalry contingent will feature regiments of 24 figures which I arbitrarily divide into two "squadrons" of 12 riders. These are not actual squadrons, but I treat them as such in my wargame armies. The artillery component will include a variety of smooth bore field guns of 6-pds and 12-pds plus Shuvulov howitzers and light 12-pound unicorn howitzers. The regimental guns will include the Shuvulov howitzers and some 3-pounders. I also added one battalion of my new Minden Russian Musketeers in Summer waistcoat and commander stands representing Galitzin and Saltykov. This brought my infantry contingent up to 4 musketeer battalions and 1 grenadier battalion in 2017. We are but a few days into the new year and I have already finished painting a second battalion of the new Minden Russian Musketeers in Summer waistcoats. 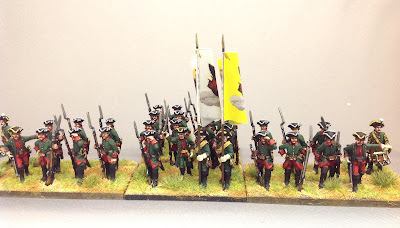 Narva Regiment with GMB Designs flags and Minden Russian Musketeers. Narva Regiment with all platoons deployed in line. You may have noticed that I have gone to a different basing system for my SYW army in order to move the figures closer together, shoulder to shoulder, if you will. 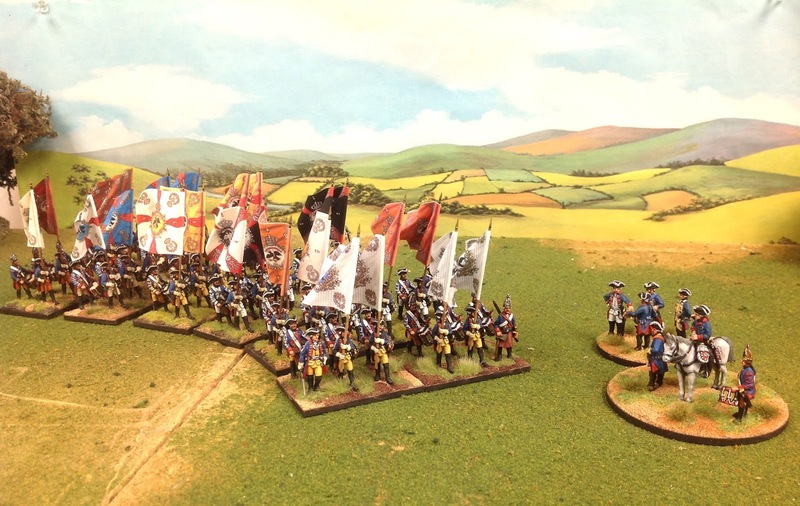 The battalions now have 32 figures on four stands compared to the old system of 30 figures on five stands. The two end stands have 9 figures each, with the drummer deployed out on the flank. The two center stands have 8 figures each. The new basing system depicting the drummers on the flanks. Note that the central core of figures on both types of stands line up. The Narva Regiment marching in column. I like the look of the outlier drummers on each side of the regiment when it is deployed into a column. Narva (front) and Moscow (rear) Russian regiments. I will do another post this week that goes into more detail on the new basing system for the Russian infantry. Yesterday saw me cleaning and assembling enough figures to paint two 32-figure Russian Musketeer battalions and four artillery batteries (2 x 12-pdrs and 2 x Shuvulov Secret Howitzers) including limbers. I hope to have all of these painted and based by the end of this month (January 2018). Russian musketeers (right) and artillery (left) are ready to be primed grey. 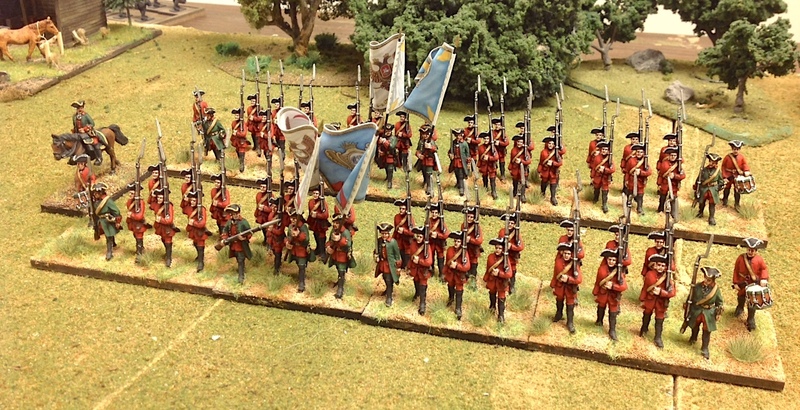 Close up of two 32-figure battalions of Russian Musketeers. Close up view of Russian artillery: two 12-pdrs (left) and two Shuvulov Howitzers (right). Minden Russian artillery crews come in loading or firing poses. I expect to have the two musketeer battalions done by the end of this month (January 2018), which would give me one Russian infantry brigade all in red Summer waistcoats and one infantry brigade wearing their Fall and Winter uniform coats of green. That would give me 8 of the 14-16 battalions that I will need for the Zorndorf game at the SYWA convention in March. We have some Russian Observation Corps musketeers and grenadiers under commission with one of our sculptors, but it might be a bit iffy to expect them to be ready in time for the convention in March. This is due to the lead time needed to not only sculpt the figures, but also to make master and production moulds, and then ship them to Fife & Drum Miniatures Central to get them bagged and ready to sell (or in my case, to get them painted). However, I expect to be able to get the OC figures ready and painted in time for either Historicon or a refight of the game in August 2018. There are also more Russian musketeers and grenadiers both in Summer and Fall/Winter kit that are on the work bench, so there should be a significant expansion of the SYW Russian range in 2018.